This book presents selected papers on the factors that serve to influence an individual's capacity in financial decision-making. 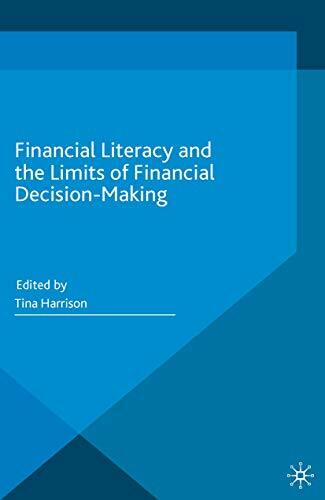 Initial chapters provide an overview of the cognitive factors affecting financial decisions and suggest a link between limited cognitive capacity and the need for financial education. The book then expands on these cognitive limitations to explore the tendency for overconfidence in decision-making and the interplay between rational and irrational factors. Later contributions show how credit card companies benefit from limitations in consumer financial literacy, how gender and cognition intersect to play an important role in financial decision-making, and how to improve financial capacity through financial literacy and education campaigns, including those addressing developed marketplaces. This comprehensive collection of papers will be of value to all readers who seek to better understand the multi-factorial and complex nature of personal financial management in today's economic climate. Dr Tina Harrison is the Personal Chair of Financial Services Marketing and Consumption at the University of Edinburgh Business School, UK. She is also the Editor of Palgrave's Journal of Financial Services Marketing.